While you read this post about exercising (or not exercising), here’s a song from my workout playlist to get you pumped up. First of all, a little background on my fitness level. I consider myself athletic. I swam in college (though swimmers are not necessarily known for their abilities on land). Since graduating, I’ve kept in shape at the gym, running, biking, yoga, and recreational sports like ultimate frisbee and Aussie rules football (briefly). Like many full-time employed adults, my workouts varied from 3-4 times per week to months of slacking. I don’t do any of these activities because I’m great at them. I’m simply happy if my skills are in the middle of the pack. I play sports, sign up for races, or attend workout classes because I enjoy it. If I beat my own previous best, even better. Before we left on this trip, I had great intentions of working out on the road. I bookmarked body-weight hotel room exercise routine videos and posts. I downloaded a few exercise-related apps I could use to stay fit. I even debated packing a stretch band for some resistance training (what a waste of space that would have been). Dan and I even went for a run on the first day of our trip, in Sydney. As the trip continued, I found myself working out less and less. I blamed the unfamiliar surroundings as a reason not to run. Shared dorm rooms are a good reason to not do chair squats or sit-ups. I’ll never be able to workout after I’ve had a drink, and I was doing a considerable amount of drinking in Asia (large bottles of Chang beer for less than $1? This is what traveling is all about!). There were times I felt guilty, just like a lot of people do when missing workouts at home. But I’ve stopped feeling guilty. I’ve discovered that traveling is its own exercise, and with a little intention, it can be the best fitness program you’ve ever done. Let me convince you. On the first half of our trip, our itinerary was ambitious, more so than we’d probably recommend to others. But moving cities every 3-4 days has its perks. 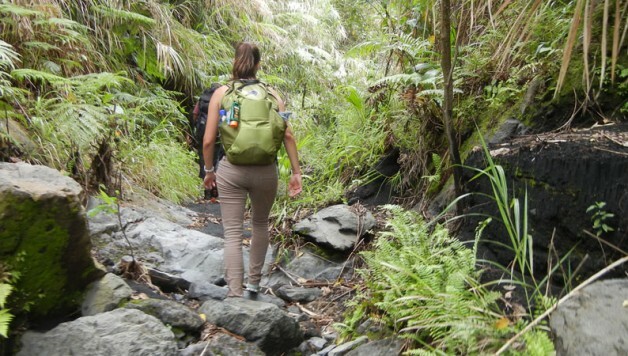 It is physically challenging to carry a daypack and suitcase (even one with wheels) across city streets, up and down subway stairs, on and off buses, and in and out of taxis, trucks, and overhead compartments. My main bag is only 20 pounds, but I can lift it over my head much easier than a year ago. Add to this the strain of standing for long periods of time, sitting in less than relaxing positions, and the occasional cardio of running across a train station or airport, and you’re on your way to a traveler’s body. 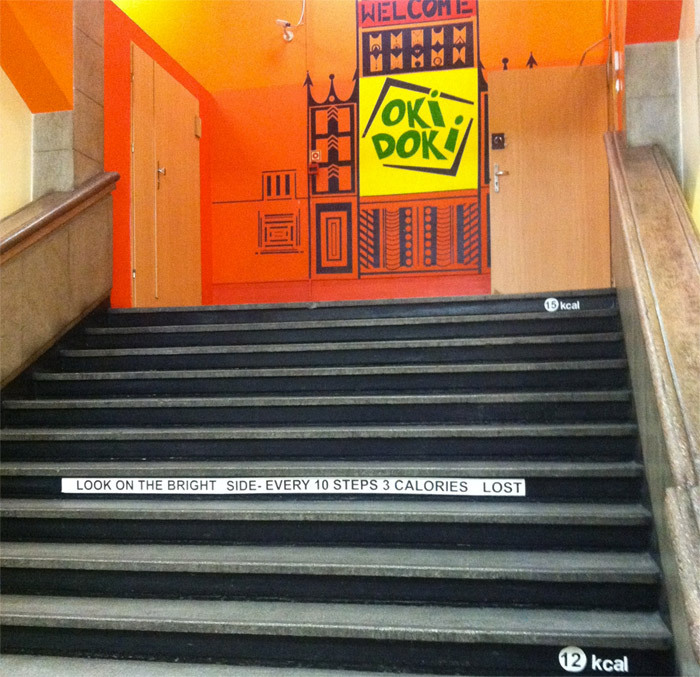 Walk everywhere – Some cities are more pedestrian friendly the others, but there is no better way to learn your way around and burn some calories than walking. Usually the first thing we do in a new city is some sort of walking tour, sometimes guided, sometimes self-guided. Travel with your own gym – Ok, not technically a full gym, but with gym equipment. I travel with resistance bands and it makes working out with resistance possible anywhere even if there are no weights available. Rent a bike – To cover more ground or get a different view of an area, we like to rent bikes or sign up for a bike tour. 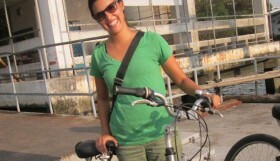 Even seemingly non-bike-friendly cities like Bangkok offer bike tours and are really fun. Germany also has great bike trails around the whole country. Biking around the vineyards in Yufin was one of the highlights of our time in Japan and we burned at least some portion of the calories we drank. Find the best view – Many cities have parks or buildings that can be climbed to offer incredible views. We’ve climbed Namsan Mountain in Seoul, Table Mountain in Cape Town, the Eiffel Tower and Sacre Coeur Basilica in Paris and others, as day or half-day outings. Generally, the harder the climb, the cheaper the entrance fee. Plus, save some money on those touristy elevator or cable car tickets! Touring a Dutch village via Amsterdam’s 16K Dam-to-Dam race. Get off the figurative beaten path to the literal beaten path – As part of our quest to stay in shape, Dan and I have tried to do something to really challenge ourselves at least once per month. 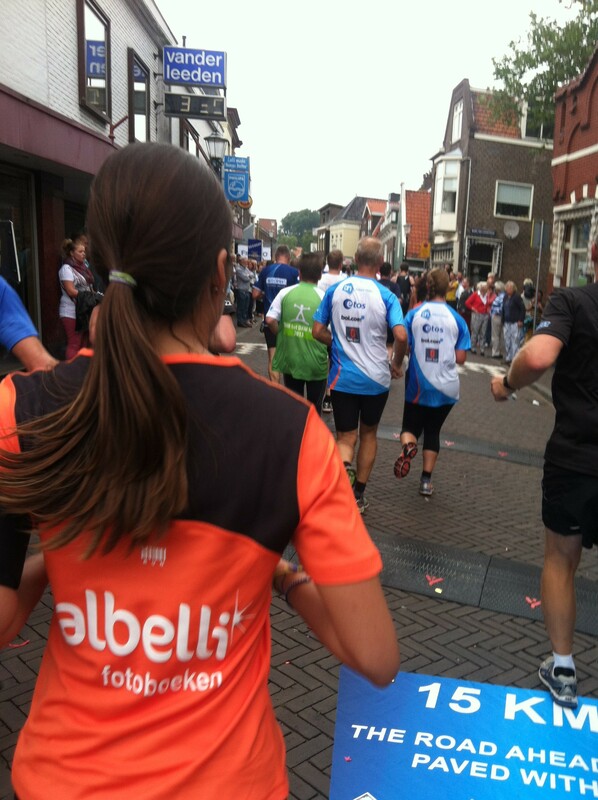 Just a few examples: We hiked a volcano in Vanuatu, trekked to some mountain tea villages in Myanmar, and ran a 16K race in Amsterdam. 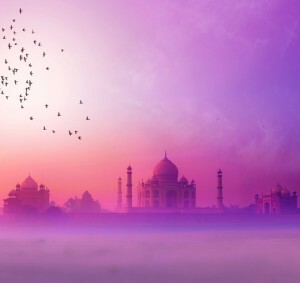 In each of these experiences, we weren’t seeing the areas surrounded by tourists, but more like locals see it, and those are the most memorable experiences for us. 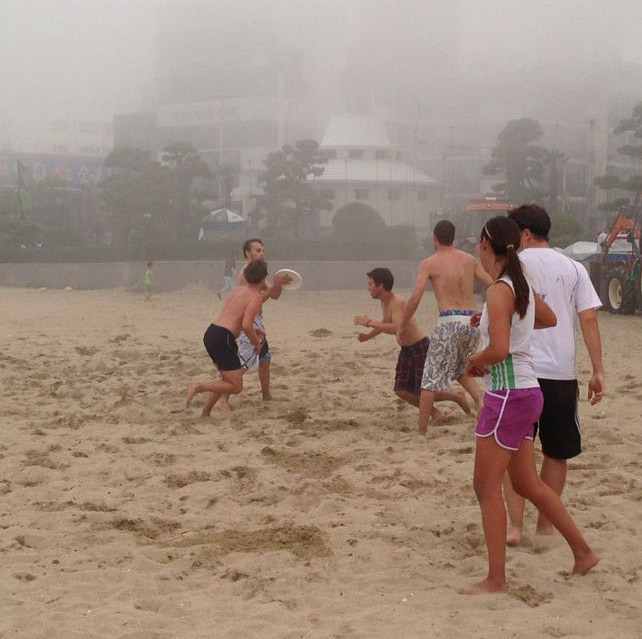 Book active activities – Even when we can’t get off the tourist trail, many of the tours we take have elements of exercise. 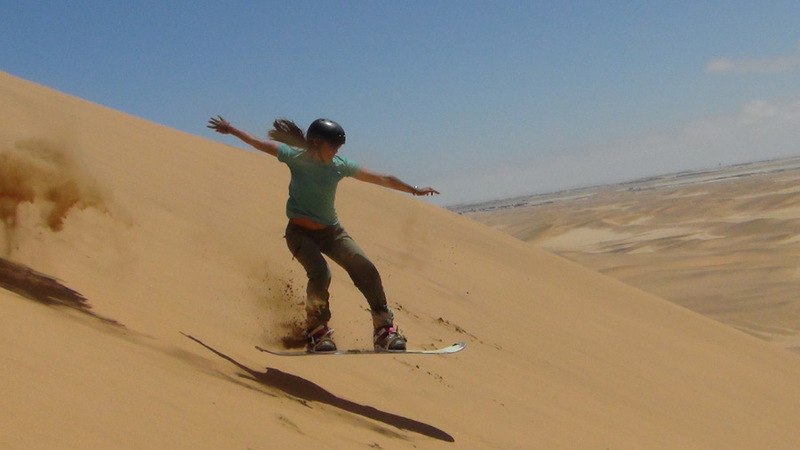 Scuba diving, skiing, or snowboarding trips are a good examples, (although out of our price range for this trip, but we loved sandboarding in Namibia). Snorkeling is always fun for me and gets the heart rate up. We learned how to surf in Australia and found boards pretty cheap to rent all over Asia. 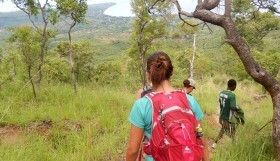 Hiking, white water rafting, horseback riding, kayaking, the possibilities are endless. Anything is better than a bus tour! 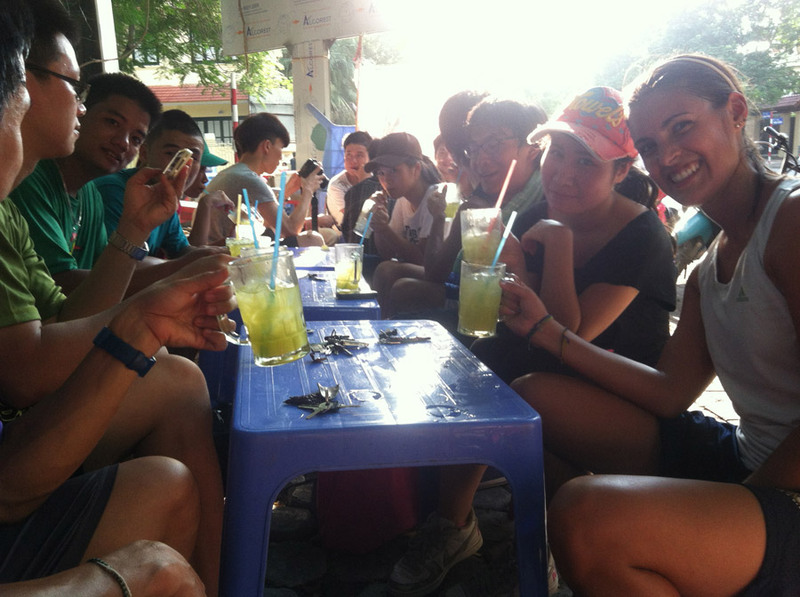 Enjoy some cane juice in Hanoi after a pickup frisbee game with some new friends. 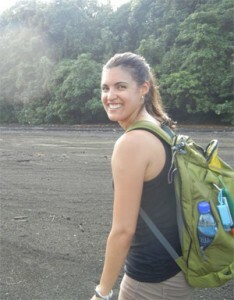 Traveling the world has made me realize how being sedentary really can affect me. When I was working 8+ hours per day at a desk, running 2-3 miles after work or even on the weekends was hard. Sometimes really hard. 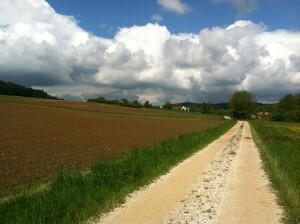 Rural Bavaria is just one of the beautiful backdrops we’ve had while running on this trip. Now, on arriving in Germany early this month, I went for a run with the intention of starting slow, and did nearly 5 (slowish) miles and felt great. Now, after 4 weeks of 2-3 runs per week, my cousin and I did a 5 mile trail run. Afterward, I spent 3 days walking and biking around Salzburg. Then today, pushing myself to 8 miles on my run felt easier than ever. Any physiology experts can correct me, but as far as recovery and strengthening of muscles, regular movement is better than sitting around clicking a mouse. All traveling requires some physical activity, and can include as much exercise as you make of it. All in the name of soaking up your surroundings! Adding movement throughout the day is much easier while traveling than most people’s daily lives, and enriches the travel experience. Do you have any recommendations for light weigh running shoes? My husband is set on bringing some so he can run while we travel, although I feel like they’ll just be excess weight Or would you suggest just having 1 pair of good walking shoes (and then some flip flops)? I loved my Nike Free running shoes, super light and easy to compact. I did replace them with Vivo Barefoot trail running shoes and they’ve been great – lightweight for packing, great for road, trail or beach running, long sightseeing walking days and even hiking. I love this article! I have found it at times increasingly challenging to exercise while on the road, but then I get that extra ounce of motivation and just go! This morning I ran stairs for 15 minutes and found a rooftop to finish off my workout of burpees, mountain climbers, high kicks and yoga!